That applies to products as well as people. Selling on price alone might get you a sale, but does it earn you a repeat customer? Giving your customer maximum value for their dollar is the key to loyalty. OMG Music is a sales, manufacturing, and distribution company that services music retailers worldwide. In business since 1990, OMG Music is proud to service over 3,000 active dealers in the US alone. We are the exclusive distribution arm of Rotosound strings in America and boast one of the largest collections of guitar straps under one roof anywhere in the world! Also offering gig bags, picks, and an array of other music instrument accessories, OMG Music has a unique mixture of products and experience that we are always excited to share with our customers. OMG Music will be at the 2018 Winter NAMM Show in Anaheim, CA. OMG Music will be in Ft. Wayne, IN exhibiting their latest gear. Be sure to stop by our booth! OMG Music will be at the 2018 Summer NAMM Show in Nashville, TN. Be sure to stop by and see what's new! OMG Music is anticipating the release of our latest catalog, showcasing our newest items available. Make sure to order or download your copy today. 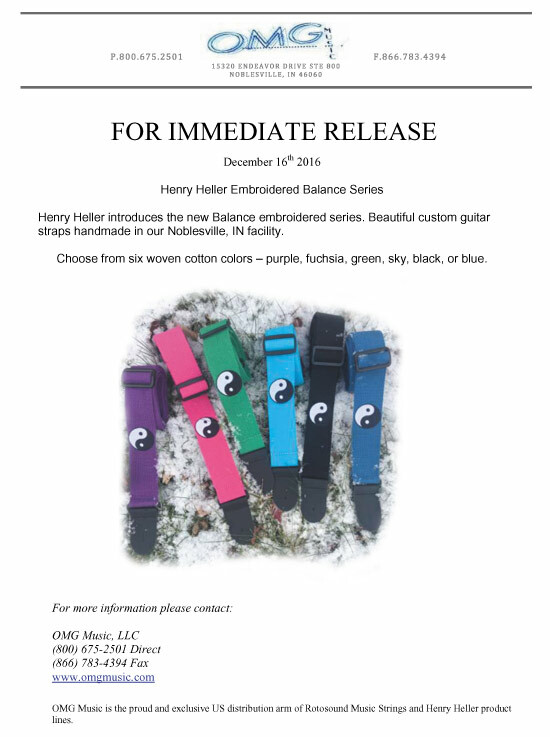 Henry Heller New Embroidered Balance Series Introduced Beautiful custom guitar straps handmade in our Noblesville, IN facility. 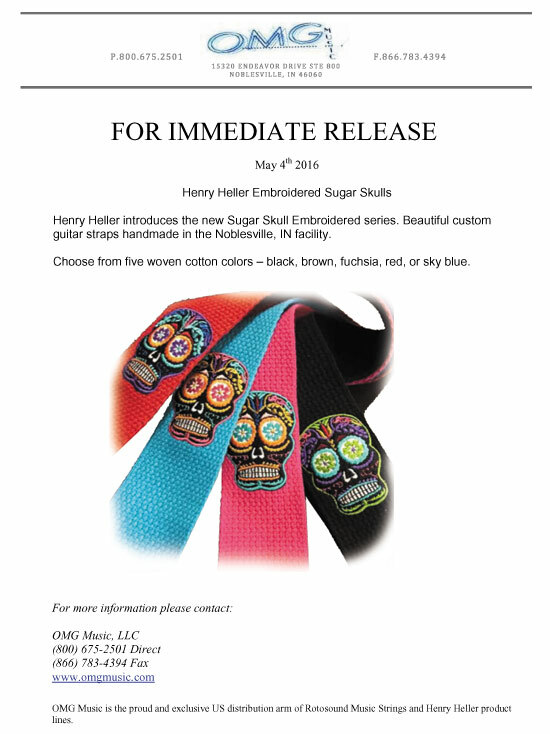 Henry Heller Embroidered Sugar Skulls Series Introduced Beautiful custom guitar straps handmade in our Noblesville, IN facility. 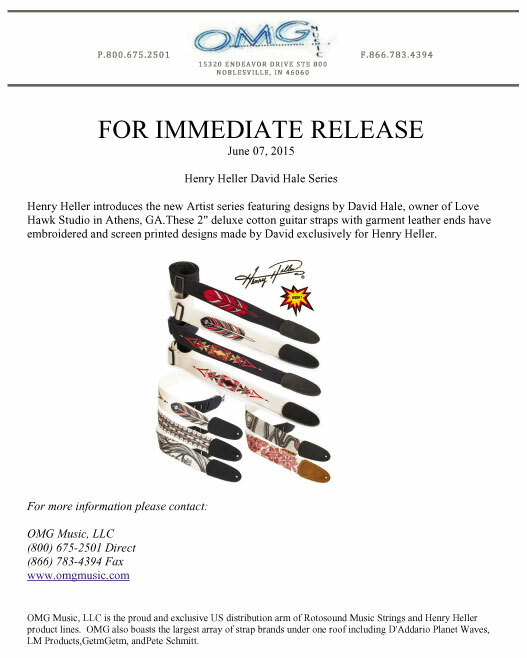 Henry Heller introduces the new Artist Series featuring designs by David Hale, owner of Love Hawk Studio in Athens, Georgia. Over the last quarter-century, OMG has grown and prospered while sticking to the ideals which have made them successful.